Each local authority in England and Wales has its own Youth Offending Team (often referred to as the YOT), which is a panel of individuals made up of members of the police, social services, education authorities, housing officers and the Probation Service, among others. The rationale behind having such a comprehensive team of people is to be able to assist young offenders across all levels of their lives. Taking an all-encompassing approach towards young offenders and the issues they face has been proven to be much more effective in terms of meeting their needs, identifying and managing the risks they pose to themselves and to other people, and reducing the likelihood of them re-offending in the future. What Does the YOT Do? It is common for the Youth Offending Team to get involved in a young person’s life once they are identified as ‘at risk’ of offending, i.e. before he or she begins to offend. A young person will be assessed to see whether or not they would qualify and/or benefit from a crime prevention programme, which seeks to address offending-type behaviour. Not only is it more cost effective to be pro-active in crime prevention, but it is also much more beneficial for the young person in question. Often a variety of factors will need to be addressed, such as having left school, trouble at home, having parents or other family members who have offended, and drug and alcohol misuse. Once a young person has been given a final warning at the police station or convicted of an offence (whether he or she has pleaded guilty or been found guilty after a trial), the Youth Offending Team will undertake an assessment of various aspects of their lives including their family situation, their home environment, their education, their attitudes and any previous criminal history, if applicable. If the young person is due to be sentenced by a court, whether in the Youth Court, Magistrates’ Court or Crown Court, they will use this information to write a report recommending the appropriate sentence for the young person. These reports are very useful to the court, the young person’s lawyer and to any other authority that may be involved in the person’s life as they can identify the areas in which a young person may need most help. If the offence has been so serious that it is likely to warrant a period of custody, assessment by the Youth Offending Team will help to identify whether a young person is particularly vulnerable (which could have a bearing on the nature of the detention or custodial centre they go to). 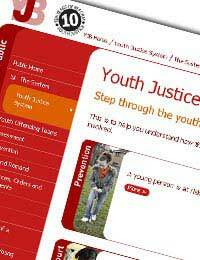 The Youth Offending Team also play a role in terms of deciding and arranging bail for young people who are in the youth justice system. There are a wide variety of options available to assist young people who are at risk of offending and those who have already offended. Before having to go to court, offending behaviour can be dealt with by way of a reprimand or a final warning at the police station. In order for this to happen, the young person must actually admit having committed the offence in question. Anti-social behaviour measures are dealt with in more detail elsewhere on this site but comprise of Acceptable Behaviour Contracts (ABC), Anti-Social Behaviour Orders (ASBO), Individual Support Orders (ISO), and Local Child Curfews. Children under 10 years old cannot be prosecuted, but can be the subject of a Child Safety Order. While on bail, young people can be subject to an Intensive Supervision and Surveillance Programme (ISSP), which is intended to allow children to remain at large rather than be sent to custody pending final resolution of their case. If a young person has responded well to an ISSP, this can be emphasised to the sentencing court as showing that he or she is more likely to respond to a community order rather than having to be sent into custody. Any sentence can also have a Curfew Order requirement, a Parenting Order or a Drug Treatment and Testing Order requirement attached to it. After a young person is released from custody, the Youth Offending Team, among other authorities, have numerous provisions to help them readjust to life outside custody. For example, Resettlement and Aftercare Provisions (RAP) are used for young people with substance misuse problems.